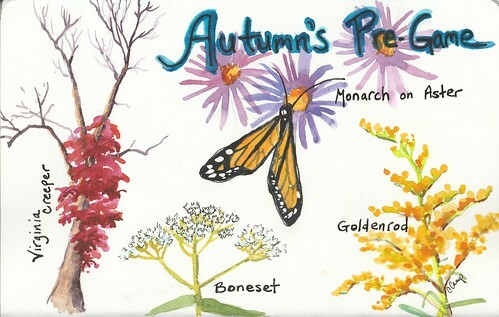 Autumn’s Pregame Watercolor – Let's Paint Nature! These warm days and cool nights are preparing the trees for a dazzling finally. But there’s so much to enjoy right now! I can taste autumn in the air. It seems like every year, autumn escapes me because the season is so short. Do you feel this as well? This time I’m soaking in nature, savoring every last drop. As I walked up to this hidden algae covered pond, I scared a great blue heron who in turn scared me as he slowly flew away. I hope you have a chance to get out and experience this season’s morph as the living plants give their last hurrah! ← Want to Get Started Painting Watercolors Outside? Hi Christine, thank you so much for following my new blog. Looks like you have some beautiful scenes to paint. Autumn is such a pretty season. Hi there! I agree, autumn is the best season especially for painting. Keep up the great work with your blog! Thanks for reminding me of all the little things we have to celebrate in nature at this time of year!